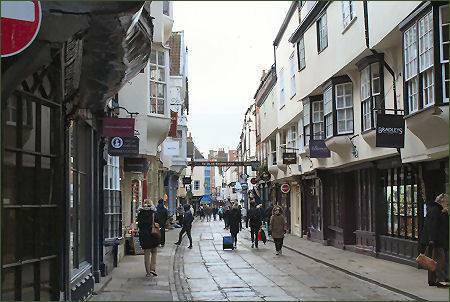 Stonegate, which runs north east from St. Helen's Square to Petergate, is one of York's most popular historic streets and one of the most architecturally varied streets in the city. The buildings which line the street today are an eclectic mixture of timber framed medieval and georgian. The name Stonegate first appears on records in 1118. Around 6 feet below the street's pavement lies the Roman Via Praetoria, which connected the Basilica at the centre of the fortress to the bridge over the River Ouse and the civilian settlement on the other side. There are a few possibilities as to the origin of the street's name, the first of these is that the stone used to build York Minster was transported from quarries by boat to a landing place where York Guildhall is now situated, then carried along the street. A further possibility is that the street had retained its Roman paved surface, while the neighbouring streets had more more roughly constructed roads. From the medieval era the top of the street was under the jurisdiction of York Minster and was home to related trades and crafts. Goldsmiths, printers and glass painters all had their premises here and have left their mark over the centuries. No. 35 Stonegate, which dates back to the late fifteenth century and is purported to be one of the most haunted houses in Britain. The building has stained glass in its fine windows. In September 1835, the young Princess Victoria of Kent, later Queen Victoria, visited the shop and took tea in the back parlour of the . it is now run as a visitor attraction called Haunted House. The Norman House, the oldest house in York, stands in a secluded courtyard accessed through an archway between numbers 50 and 52 Stonegate. The Norman House is the oldest house in York and from the few surviving pieces of decorative masonry, is believed to date to between 1170 to 1180. It is also the oldest example of domestic stonework still standing in its original location. 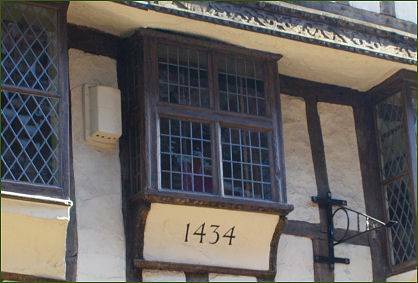 The building consists of two walls embedded in the rear walls of Nos 46, 48 and 50 Stonegate and well preserved first floor windows with fine tracery. 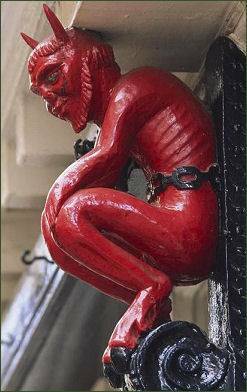 The chained red devil which is situated high up, against the wall outside No. 33 (pictured above right) is a traditional symbol of a printer, the printer's devils were the small boys who were used to fetch and carry type, the sign indicates the way to Coffee Yard where, in the eighteenth century, the writer and publisher Thomas Gent had his premises. Gent wrote one of the first histories of York and married into a printing family, but ruined the business after repeatedly arguing with many of his customers, including the Dean and Chapter of York. 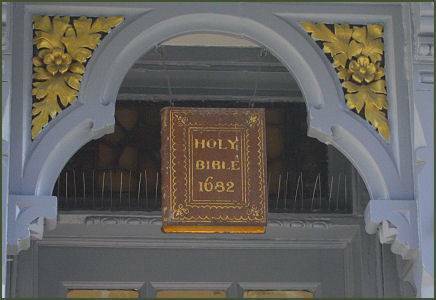 The golden bible, dated 1682 hangs above the doorway of 35 Stonegate. The building now serves as a gardening shop, but the bible was a sign that the shop beneath was a bookshop. 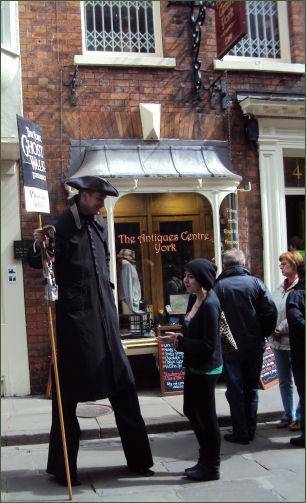 In the eighteenth and nineteenth centuries the shop was said to be York's premier bookshop. The 'Sign of the Bible' also had a printing press and in 1759 John Hinxman published the first two volumes of Laurence Sterne's 'Tristram Shandy'. The glass painter's church was St Helen (pictured right) which is situated in the square at the end of Stonegate. 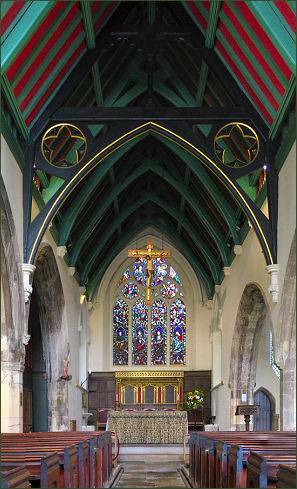 A church of St Helen, Stonegate has occupied the site for a thousand years or more. The church is dedicated to St Helen, mother of Constantine the Great, the first Emperor to allow Christian worship in the Roman empire. The present building largely dates from the fifteenth century, with elements from both earlier and later periods. It was declared redundant in 1551 and partially demolished, but survived and was later brought back into use. The arms of 'The Worshipful Company of Glaziers' can be seen in one of the windows. There is also limestone font which dates from the twelfth century. The pipe organ was built by Ward of York and dates from 1819. 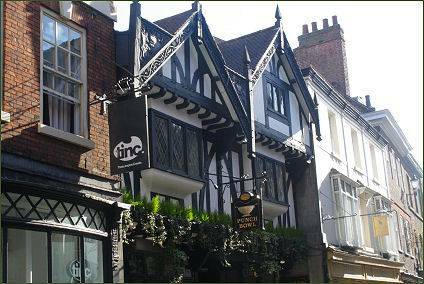 The Olde Starre Inn, located in one of the alleys just off Stonegate, claims to be the oldest public house in York and dates back to 1644, the year the Parliamentarians besieged York. The 'old star' is said to be King Charles I. The Parliamentarian army used its tenth century cellar as a hospital and a mortuary during the Civil War. The Gallows sign which straddles the width of the street and advertises the inn dates to 1793. The inn is said to have a number of resident ghosts. One of these is a Royalist officer of 1644 from the time of the Civil War, who is reported to wear a beaver hat, doublet and breeches. Mulberry Hall (pictured left), dates to 1434. 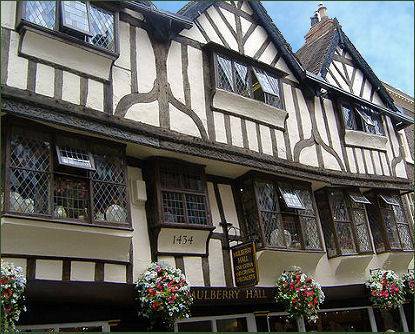 Almost six hundred years old, this timber framed building has been a shop since the eighteenth century and is now a prominent china and porcelain shop. Coffee Yard is situated next to Mullberry Hall, in the 1980's the York Archaeological Society examined the buildings in Coffee Yard prior to development, were they discovered the remains of a fourteenth century building hidden beneath the relatively modern facade of a derelict office block. The structure was originally built in about 1360 by the monks of Nostell Priory, a monastery near Wakefield. Thomas de Dereford, Prior of Nostell from 1337 to 1372, arranged for the building of a hostel in York. It was later extended in the fifteenth century. In the mid fifteenth century it was, for at least 20 years, the home of William Snawsell goldsmith, Alderman and Lord Mayor of York. A decision was reached to reconstruct the building as it might have appeared in 1483, it was named Barley Hall after the Trust's chairman, Professor Maurice Barley. The post-medieval fabric of the building was largely demolished and a new timber frame was built. It has been decorated to replicate what it would have looked like as a home of around 1483. Furniture and fittings are based on an inventory made in 1478.